Are you one of the “Can I sub fries with a side salad with burger” kind of people? I certainly am. And don’t get me wrong, I LOVE fries - especially sweet potatoes fries - but I consider them a “treat” food, so I order them just once in a while. And I get my fair share of weird looks from waiters when I make such request. A 6’3” tall guy asking to sub fries with a salad, kind of catches them off-guard, I get it. But now that I’m thinking about it, this is such a lame excuse. It basically makes me sound like an old man having heartburn. Next thing I know, they’ll be offering me an antacid chewable tab to ease my pain. Ouch! So why I ask for the sub? Because no matter how tasty fries are, they are laden with calories, fats and sodium. In other words: Running on fries? Not happening. At least, I certainly can’t. I tried once, and I felt like I was running carrying a backpack full of rocks. Not good. 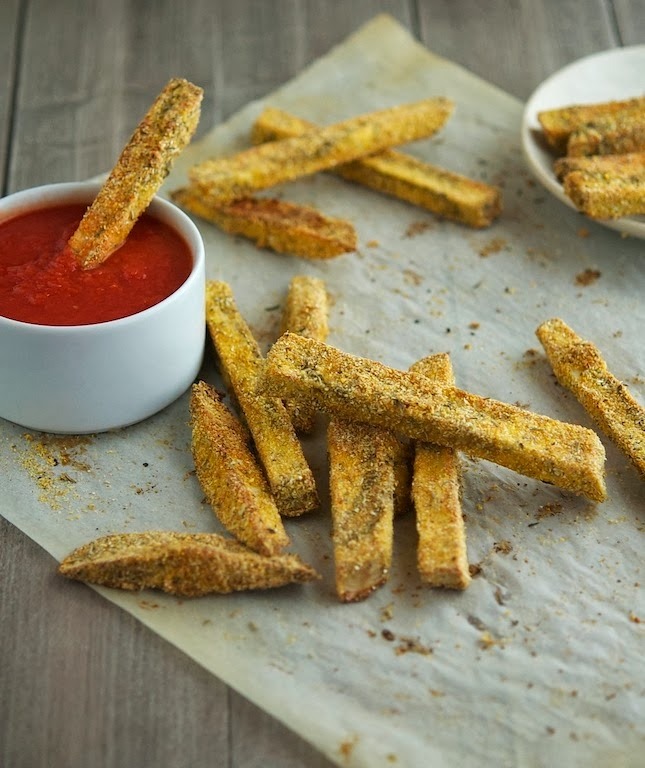 Having settled that “fries + working out not a good combo”, we now entering the realm of baked veggies that look like fries and somewhat taste like fries but are light and healthy because they’re baked. Because yes, baking good, frying not so good (note that I didn’t use the word bad btw). Along these lines, last summer we made Oven-Baked Spiced Sweet Potato Fries. Now, those were good. Pretty similar to the real deal. 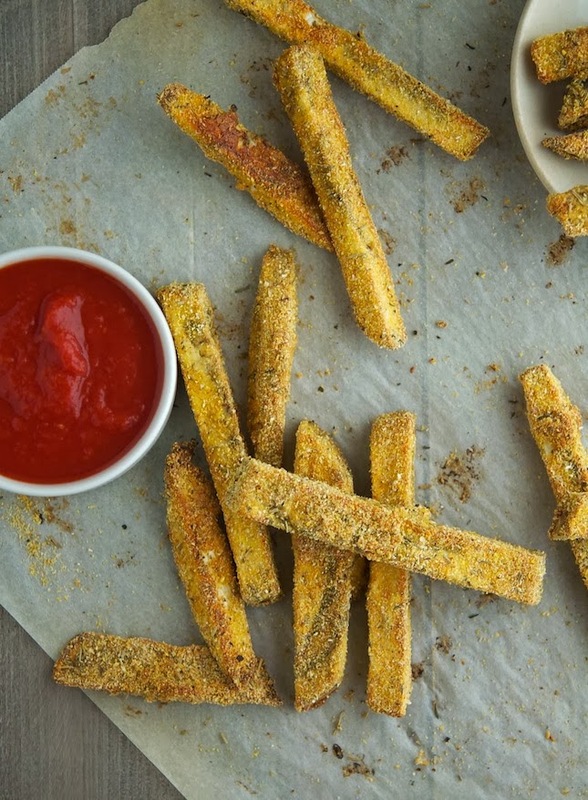 Today, instead, we’re using eggplant to create a distant relative of fries: Baked eggplant fries. They’re really simple to make, as there’s hardly any cooking involved. Cutting, coating and baking. That’s about it, a complete no-brainer. 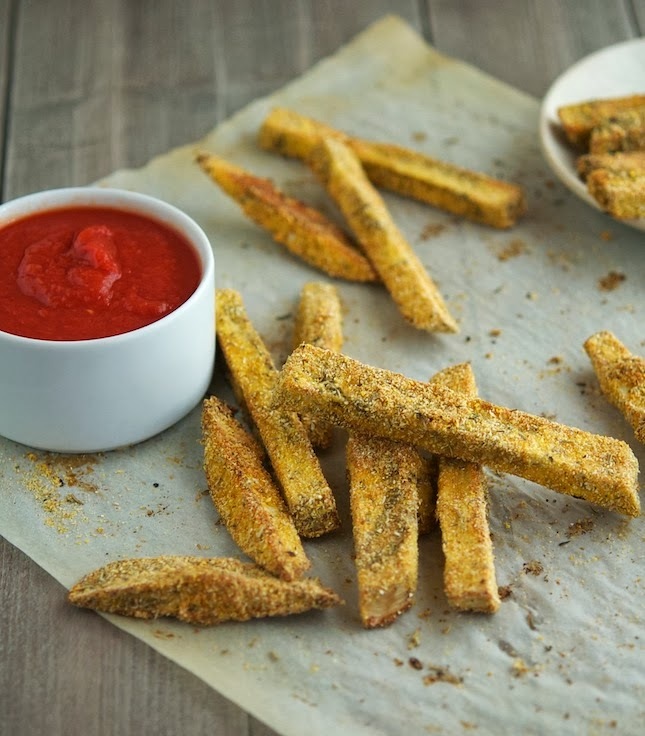 These baked eggplant fries are super crispy and yummy, and when paired with a tasty tomato sauce they’re going to make you crave. Promise. 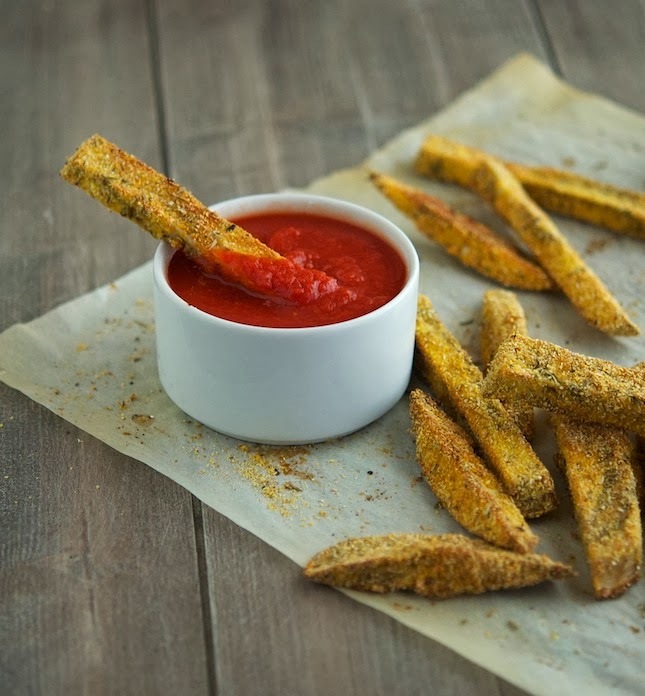 Baked Eggplant Fries with Spicy Tomato Sauce Print this recipe! Note. You can use almond flour+arrowroot powder or just plain cornmeal for the coating. Both works and are super good. Your choice. Lay eggplant matchsticks in a single layer on a baking sheet lined with paper towels. Sprinkle with 1 teaspoon of salt and let stand for 25 minutes. At the 25-minute mark, pat dry the eggplant matchsticks with paper towels. Preheat oven to 400°F (200°C) and place a rack in the middle. Lightly grease with olive oil a baking sheet. In a medium bowl, combine remaining ½ teaspoon of salt, almond meal+arrowroot powder (or cornmeal), garlic powder, paprika and oregano. Crack two eggs in a small bowl and lightly beat. One by one, dip the eggplant matchsticks in the beaten eggs, and transfer to the almond meal mixture (or cornmeal), being sure to coat them thoroughly. Place eggplant matchsticks on a baking sheet and bake for 20-25 minutes, flipping them at the 12 minute mark. To make the tomato sauce, in a large skillet combine the olive oil, red pepper flakes, garlic and sea salt. Stir while you heat the skillet over medium heat, saute for about 2 minutes or so until everything is fragrant. You don’t want the garlic to brown though. Stir in the tomatoes and heat to a gentle simmer, this takes just a couple minutes. Lower the heat and taste it. If the sauce needs more salt add it now. Then, stir in the lemon zest. Serve. One serving (about 8 to 10 fries) yields 115 calories, 8.8 grams of fat, 6.6 grams of carbs and 3.75 grams of protein. I say you should keep the fries and ditch the bun instead! The waiters would look at you even funnier. ;) Plus, one can't run efficiently on a burger anyway. At least I know I can't. I can't run or work out on any type of food, period. For me, food + exercise = not a good combo. And thank you for not using the word bad! Not so good, I can live with. But bad? I wouldn't have it. Well, you need fuel to run/workout, and fries (and in general fried food), so not for me. Burger way better (bun-on or bun-off), still not ideal. A pre-workout smoothie it's still the best option available, no doubt about that. And yes, you can definitely fry the eggplant matchsticks. Just keep me in the dark when you're doing it! Love love love these! Can't wait to try them. I love baking up crispy and healthy eggplant.I make it all of the time. My latest breading is a mix of quinoa flakes and parmesan cheese- it is so beyond delicious I intend to make it tonight! Quinoa flakes + parmesan sounds fantastic, I'm so gonna try it! Yum! I love eggplant. Will have to give these a try. Same here Lauren, eggplant lover big time. These baked fries are truly fantastic, let me know how you like 'em! I hear you mate. Grilling is good but can get boring after a bit, it's good to have options. I eat fries only when it's baked like this, looks this good and made at home. Thankfully I can avoid it outside.